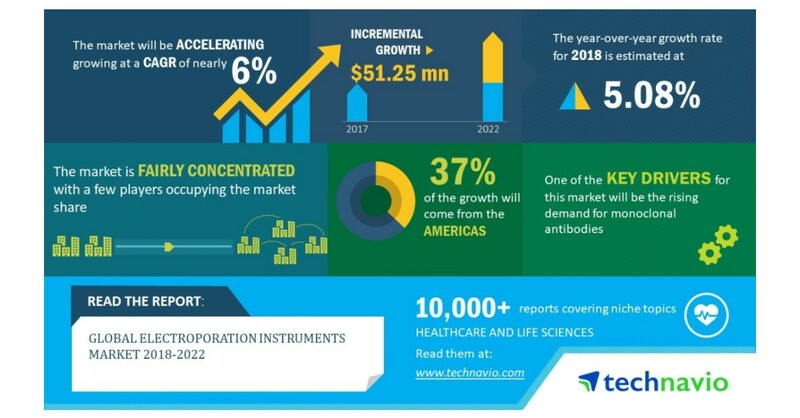 LONDON–(BUSINESS WIRE)–Technavio analysts forecast the global electroporation instruments market to grow at a CAGR of close to 6% during the forecast period, according to their latest market research report. The high demand for biopharmaceuticals is one of the major trends being witnessed in the global electroporation instruments market 2018-2022. Biopharmaceuticals are manufactured or extracted from biological sources. Some biopharmaceuticals include vaccines, blood components, allergens, stem cells, tissues, gene therapies, antibodies, and recombinant therapeutic protein and living cells, which are used for therapeutic purposes. They also include regenerative medicine in which tissue or part of the organ is replaced with the help of stem cells in patients suffering from severe chronic diseases. Monoclonal antibodies are identical immune cells and are one of the fastest growing products in the pharmaceutical industry. They have a wide array of applications in the fields of biology, diagnostic imaging, medicine, and biochemistry. Some of the medical applications include areas related to cancer, multiple sclerosis, rheumatoid arthritis, cardiovascular diseases, Crohn’s disease, psoriasis, and ulcerative colitis. The increase in demand for monoclonal antibodies has triggered the development of new technologies for their production. The global electroporation instruments market research report provides market segmentation by end-user (pharmaceutical and biotechnology companies, academic and research institutes, and CROs), and by region (the Americas, EMEA, and APAC). It provides an in-depth analysis of the prominent factors influencing the market, including drivers, opportunities, trends, and industry-specific challenges. Of the three major end-users, the pharmaceutical and biotechnology companies held the largest market share in 2017, contributing to over 46% of the market. This end-user segment will dominate the global market throughout the forecast period. The Americas held the largest share of the market in 2017, accounting for close to 46% share, followed by EMEA and APAC respectively. The growth in the region can be attributed to the advances in biotechnology and pharmaceutical companies.